Ariel., Gideon B., Ph. D.
In order to accurately assess man's biomechanical system, it is necessary to resort to scientific methods of research which are capable of accurately determining the various human mechanical changes. 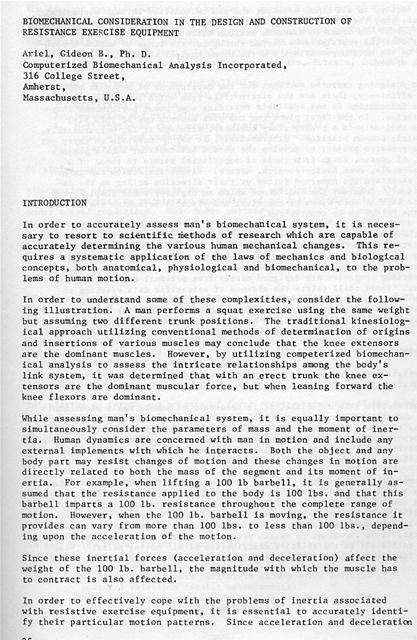 This requires a systematic application of the laws of mechanics and biological concepts, both anatomical, physiological and biomechanical, to the problems of human motion. In order to understand some of these complexities, consider the following illustration. A man performs a squat exercise using the same weight but assuming two different trunk positions. The traditional kinesiological approach utilizing conventional methods of determination of origins and insertions of various muscles may conclude that the knee extensors are the dominant muscles. However, by utilizing competerized biomechanical analysis to assess the intricate relationships among the body's link system, it was determined that with an erect trunk the knee extensors are the dominant muscular force, but when leaning forward the knee flexors are dominant. While assessing man's biomechanical system, it is equally important to simultaneously consider the parameters of mass and the moment of inertia. Human dynamics are concerned with man in motion and include any external implements with which he interacts. Both the object and any body part may resist changes of motion and these changes in motion are directly related to both the mass of the segment and its moment of inertia. For example, when lifting a 100 lb barbell, it is generally assumed that the resistance applied to the body is 100 lbs. and that this barbell imparts a 100 lb. resistance throughout the complete range of motion. However, when the 100 lb. barbell is moving, the resistance it provides can vary from more than 100 lbs. to less than 100 lbs., depending upon the acceleration of the motion. Since these inertial forces (acceleration and deceleration) affect the weight of the 100 lb. barbell, the magnitude with which the muscle has to contract is also affected. are factors in all human movement and can be modified through mechanical means, they therefore, must be incorporated in the design of the exercise equipment. In order to maintain maximum muscular efforts, it is necessary that the resistance be varied throughout the range of motion according to the motion parameters and the biomechanical changes in the body's link system. When designing exercise machines for the development of muscular strength and efficiency, there are two alternatives from which to choose if pertinent information is not available regarding some human performance charteristics. In the first place one can pick answers out of thin air; this obviously is a pretty risky business, although it is, unfortunately, a fairly common practice. Alternatively, it may be possible to carry out some research project to develop the needed information; such a project can, of course, range from those of superficial nature to those of a broad-scale, even basic-research, nature. Visual inspection can in no way ascertain the numerous forces or their direction acting on the individual. Consider the confidence which an engineer would inspire were he to look at both sides of the river and visually determine the details of the bridge to be constructed. Another goal in designing exercise machines is to optimize the resultant resistance force at the proper direction. When the force is determined only perceptually it is very likely that the design will lack maximal efficiency since guessing is involved. Presently, many exercise machines in various companies are designed merely from personal observations and ideas. There still exists the absence of scientific data relating to each individual athlete and his specific performance. It is almost impossible to design an appropriate exercise machine from just an idea or observation. Whether or not, an athlete is using his body efficiently on the correct equipment cannot be determined by visual observation alone. In weight training, the ultimate objective is for the muscle to function at maximum force throughout the range of movement. To accomplish this objective, it is necessary to assess man's biomechanical changes and then develop a resistance intensity that will accommodate those changes. The variations in resistance intensity must be precisely incorporated into a variable resistance lifting mechanism. It is likewise essential that the overall machine design and operation do not adversely affect the performance of this mechanism. To prevent machine design failures and operational failures, it is necessary to understand the relative effects of inertia. Inertial forces affect the motion and the magnitude of the muscle's involvement. The smaller the inertial force produced by the machine's moving parts, the greater the muscular involvement. In order to maintain small inertial forces, it is important to retain proper mechanical balances in the lifting ratios and in the relative distribution of all moving parts. These two factors cannot be ignored in optimum equipment design. The laws of physics apply to any system in motion regardless of whether the system is a human or machine. The human body may be likened to a machine made up of mechanical members: the joints serve as fulcrums and the contracting skeletal muscles exert forces on the segments. The segments of the human body form a link system consisting of segments such as the foot, shank, thigh, trunk, shoulders, upper-arm, forearm, and hand. The kinetic analysis involves the following steps: 1. 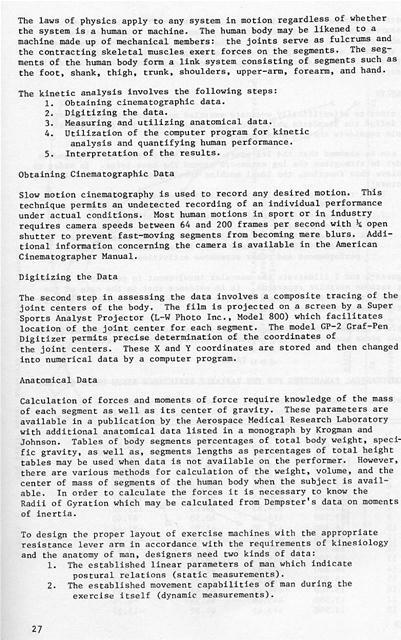 Obtaining cinematographic data. 2. Digitizing the data. analysis and quantifying human performance. 5. Interpretation of the results. Slow motion cinematography is used to record any desired motion. This technique permits an undetected recording of an individual performance under actual conditions. Most human motions in sport or in industry requires camera speeds between 64 and 200 frames per second with / open shutter to prevent fast-moving segments from becoming mere blurs. Additional information concerning the camera is available in the American Cinematographer Manual. the joint centers. These X and Y coordinates are stored and then changed into numerical data by a computer program. Calculation of forces and moments of force require knowledge of the mass of each segment as well as its center of gravity. 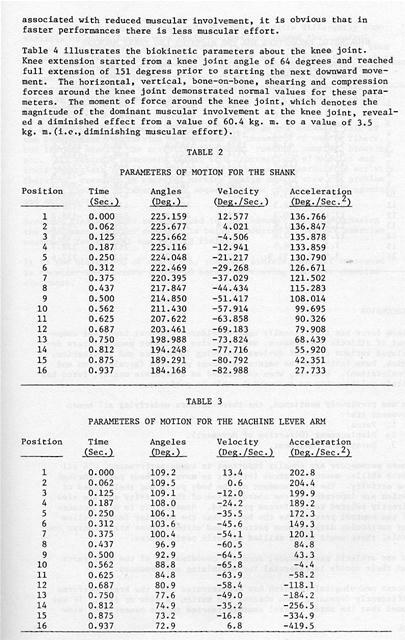 These parameters are available in a publication by the Aerospace Medical Research Laboratory with additional anatomical data listed in a monograph by Krogman and Johnson. Tables of body segments percentages of total body weight, specific gravity, as well as, segments lengths as percentages of total height tables may be used when data is not available on the performer. However, there are various methods for calculation of the weight, volume, and the center of mass of segments of the human body when the subject is available. In order to calculate the forces it is necessary to know the Radii of Gyration which may be calculated from Dempster's data on moments of inertia. Static measurements are relatively simple in comparison with dynamic measurements, which require specific, often unique, design features to enable optimized muscular effort. The dynamic data allowed development of apparatus which assign different resistances throughout the range of motion in order to accommodate the biomechanical changes occurring during exercise. In order to scientifically evaluate exercise machines, it is necessary to define the standards which they should maintain. The following example considers the leg press machine. 1. A resistance capable of maintaining maximum muscular range of motion. 2. A machine design capable of reducing the effects of shearing forces. 3. A machine capable of maintaining the natural acceleration pattern of the leg extensors as is required in athletic performances and other strenuous activities. 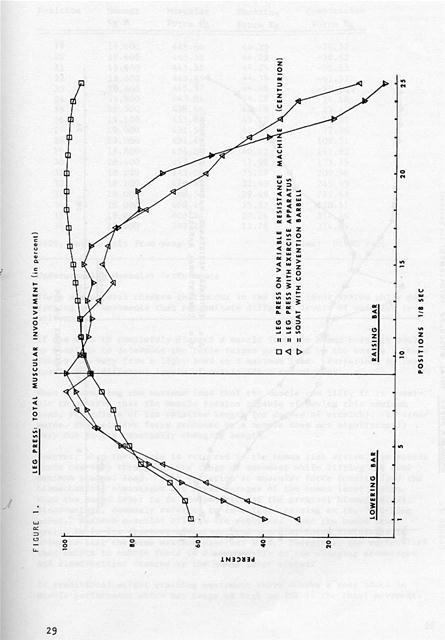 Figures 1 and 2 illustrate the muscular involvement in percent of maximum for various exercise apparatus. It is evidence that in the case of the variable resistance apparatus there is more muscular involvement throughout the range of motion. 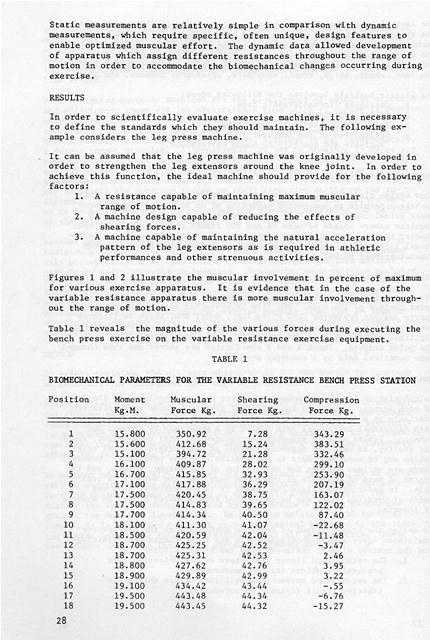 Table 1 reveals the magnitude of the various forces during executing the bench press exercise on the variable resistance exercise equipment. Kg.M. Force Kg. Force Kg. Force Kg. Kg-M.	Force Kg. Force Kg. Force Kg. 9999, normal exit from prog. Time: 0.990 sec. There are natural changes that occur in the human lever system while performing any movements that necessitate different levels of muscular involvement. If one were to completely dissect a muscle from the human body, it would be possible to determine the force ranges generated by the muscle. These ranges can vary from a light load to a maximum load. Variations in load result from different levels of muscle fiber recruitment. When determining the maximum load that the muscle can lift, it is possible to observe that the muscle remains capable of moving this maximum load, regardless of its relative length (or degree of stretch). In other words, the relative force produced by a muscle does not significantly vary due to its constantly changing length. 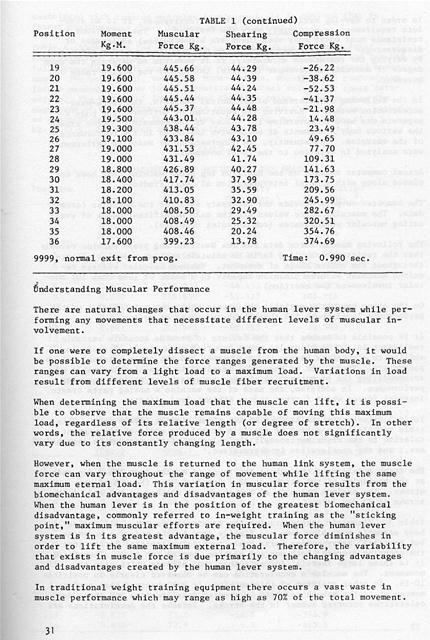 However, when the muscle is returned to the human link system, the muscle force can vary throughout the range of movement while lifting the same maximum eternal load. This variation in muscular force results from the biomechanical advantages and disadvantages of the human lever system. When the human lever is in the position of the greatest biomechanical disadvantage, commonly referred to in-weight training as the "sticking point," maximum muscular efforts are required. When the human lever system is in its greatest advantage, the muscular force diminishes in order to lift the same maximum external load. Therefore, the variability that exists in muscle force is due primarily to the changing advantages and disadvantages created by the human lever system. In traditional weight training equipment there occurs a vast waste in muscle performance which may range as high as 70% of the total movement. In order to develop maximum conditioning effectiveness, it is an absolute requirement to accurately vary the resistance. The variations in resistance must occur only when there are biomechanical advantages or disadvantages which decrease or increase the required muscular efforts. By varying the resistance accurately, it is possible to maintain the same degree of muscular involvement (efforts) throughout the entire range of movement. 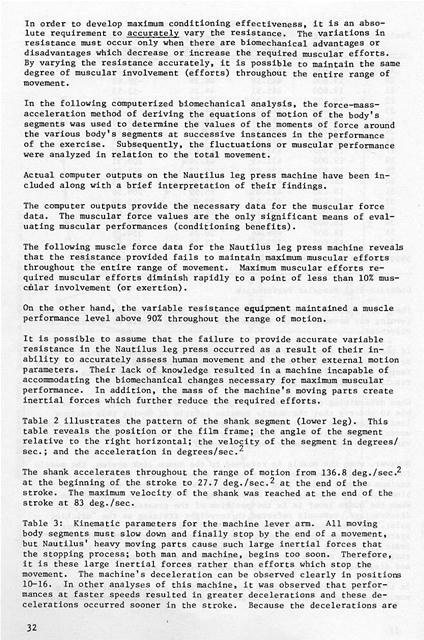 In the following computerized biomechanical analysis, the force-massacceleration method of deriving the equations of motion of the body's segments was used to determine the values of the moments of force around the various body's segments at successive instances in the performance of the exercise. Subsequently, the fluctuations or muscular performance were analyzed in relation to the total movement. 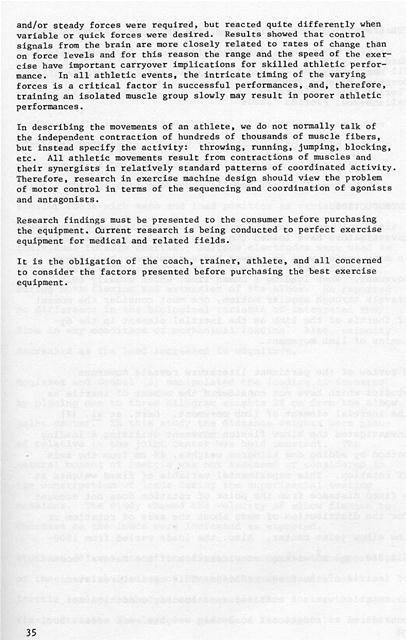 Actual computer outputs on the Nautilus leg press machine have been included along with a brief interpretation of their findings. 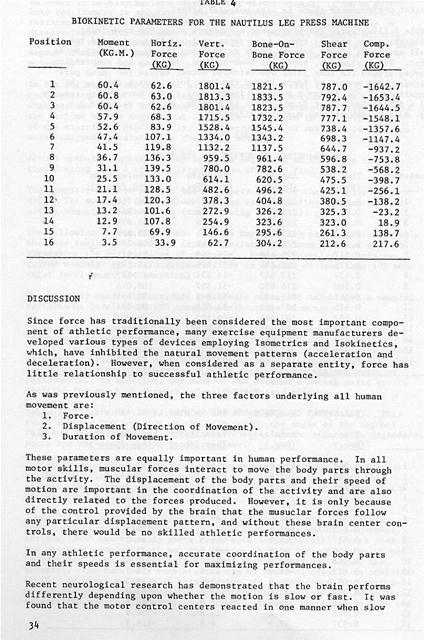 The computer outputs provide the necessary data for the muscular force data. The muscular force values are the only significant means of evaluating muscular performances (conditioning benefits). 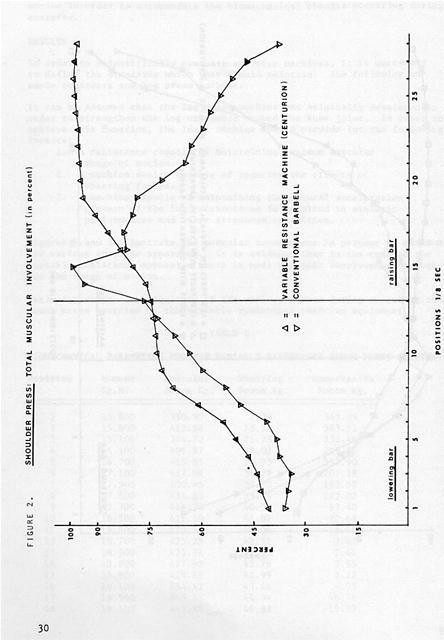 The following muscle force data for the Nautilus leg press machine reveals that the resistance provided fails to maintain maximum muscular efforts throughout the entire range of movement. Maximum muscular efforts required muscular efforts diminish rapidly to a point of less than 10% muscular involvement (or exertion). On the other hand, the variable resistance equipment maintained a muscle performance level above 90% throughout the range of motion. It is possible to assume that the failure to provide accurate variable resistance in the Nautilus leg press occurred as a result of their inability to accurately assess human movement and the other external motion parameters. 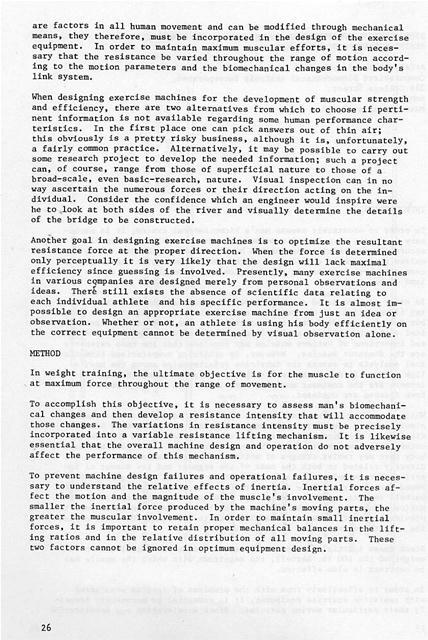 Their lack of knowledge resulted in a machine incapable of accommodating the biomechanical changes necessary for maximum muscular performance. In addition, the mass of the machine's moving parts create inertial forces which further reduce the required efforts. The shank accelerates throughout the range of motion from 136.8 deg./sec.2 at the beginning of the stroke to 27 7 deg./sec.2 at the end of the stroke. The maximum velocity of the shank was reached at the end of the stroke at 83 deg./sec. associated with reduced muscular involvement, it is obvious that in faster performances there is less muscular effort. Table 4 illustrates the biokinetic parameters about the knee joint. Knee extension started from a knee joint angle of 64 degrees and reached full extension of 151 degress prior to starting the next downward movement. The horizontal, vertical, bone-on-bone, shearing and compression forces around the knee joint demonstrated normal values for these parameters. The moment of force around the knee joint, which denotes the magnitude of the dominant muscular involvement at the knee joint, revealed a diminished effect from a value of 60.4 kg. m. to a value of 3.5 kg. m.(i.e.,diminishing muscular effort). Position	Moment	Horiz. Vert. Bone-On-	Shear	Comp. 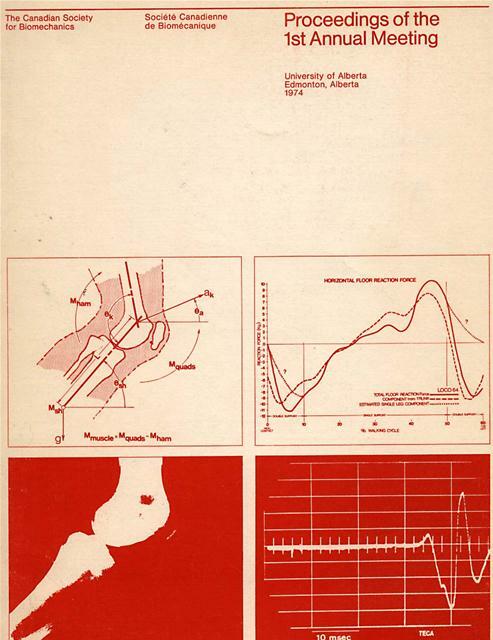 Since force has traditionally been considered the most important component of athletic performance, many exercise equipment manufacturers developed various types of devices employing Isometrics and Isokinetics, which, have inhibited the natural movement patterns (acceleration and deceleration). However, when considered as a separate entity, force has little relationship to successful athletic performance. 2. Displacement (Direction of Movement). any particular displacement pattern, and without these brain center controls, there would be no skilled athletic performances. In any athletic performance, accurate coordination of the body parts and their speeds is essential for maximizing performances. and/or steady forces were required, but reacted quite differently when variable or quick forces were desired. Results showed that control signals from the brain are more closely related to rates of change than on force levels and for this reason the range and the speed of the exercise have important carryover implications for skilled athletic performance. In all athletic events, the intricate timing of the varying forces is a critical factor in successful performances, and, therefore, training an isolated muscle group slowly may result in poorer athletic performances. the independent contraction of hundreds of thousands of muscle fibers, but instead specify the activity: throwing, running, jumping, blocking, etc. All athletic movements result from contractions of muscles and their synergists in relatively standard patterns of coordinated activity. Therefore, research in exercise machine design should view the problem of motor control in terms of the sequencing and coordination of agonists and antagonists. Research findings must be presented to the consumer before purchasing the equipment. Current research is being conducted to perfect exercise equipment for medical and related fields. It is the obligation of the coach, trainer, athlete, and all concerned to consider the factors presented before purchasing the best exercise equipment. Generated on 4/20/2019 11:14:26 AM (PST) ADI/HQ/GBA/2019/ARIELCLOUD/v3.0.2018.0126.